Don't trust getting your trailer hitch from just anyone. The staff at Restless Wheels RV is trained to ensure a proper hitch installation for your vehicle and whatever you are towing. The most important consideration when buying a trailer hitch is the amount of weight you will be towing or for what you intent to haul (Including bike rack or other accessory).Towing requires proper hitch installation for safety and a smooth ride. The Hitch Shop staff will check the weight limitations of your tow vehicle. Hitches are a one piece welded unit and are specific for different vehicles. There really is no "universal" hitch. Proper installation takes a variety of factors into consideration including the tow vehicle and trailer height, weight, related trailer tongue weight, your vehicle's towing capacity, and weight distribution. 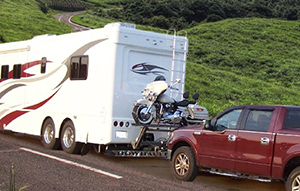 Towing a vehicle behind your RV can be a great convenience. Perhaps you are RVing and you want the family car for sightseeing and errands. Towing options vary including towing on a trailer with all the wheels off the ground (called four wheels up) or two on a tow dolly elevating only the front two wheels, or you can tow it with a tow bar and have all four wheels on the road. Towing with four wheels down is a very popular way to haul a vehicle given tow bars are light, convenient, easy to use and generally cheaper than other options. Discuss your needs with our installation staff to determine what will work best for your needs. Restless Wheels carries Blue Ox base plates and tow bars for four wheels off down towing. Base plates are designed to help you safely tow your vehicle. 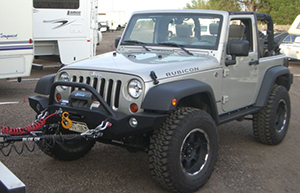 The purpose of a towing base plate is to connect the tow bar to the vehicle you are going to tow. To safely tow a vehicle any distance or on the highway, base plates are essential. There are a variety of styles that allow for permanent or removable draw bars. Different attachment methods will allow you to choose the system that best fits your towing needs. 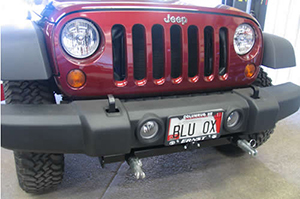 Blue Ox base plates fit under the front end of your towed vehicle as a permanent attachment point for your tow bar for towing a vehicle behind your RV. On most vehicles, they won’t hang below or rise above your bumper or grill. Blue Ox is known internationally for its quality towing products. Base plates are designed to use existing hardware and holes for mounting the base plate to a towed vehicle. Restless Wheels professional installation staff will ensure the proper base plate is secured and that existing bolts are adequate for baseplate mounting to your vehicle. 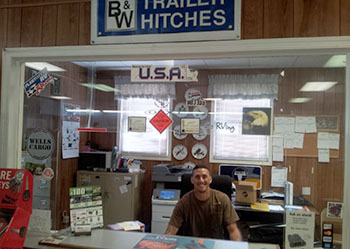 Quality trailer hitch products and superior custom service is why you should go to the Restless Wheels HITCH SHOP. They carry the best names in the industry. Not only do we have a large range of products, we install and service them as well. Anything you need such as trailer brakes, tow bars, brake controllers, etc., the professionally trained staff at Restless Wheels is here to help. We will custom fit your trailer hitch matching your vehicle make, model and year to what you will be towing. Stop in and be amazed at all we have to offer. 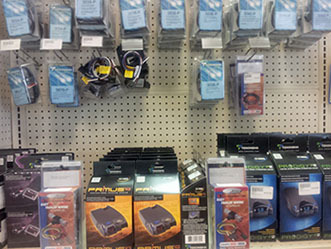 We carry a large inventory of parts but if we do not have it in stock, we will order it for you. We are confident you will agree we offer fair prices. Complete the form on this page to contact our Hitch Department or call us at 703-257-1067.